One of my very first “letters to Josep” style e-mails to you was an attempt at explaining the Jewish year and all its holidays. The e-mail was about the length of your living room table, and all it accomplished was to profoundly confuse you. I realized I would probably have to break it down and explain each component to you separately… and the rest is history! 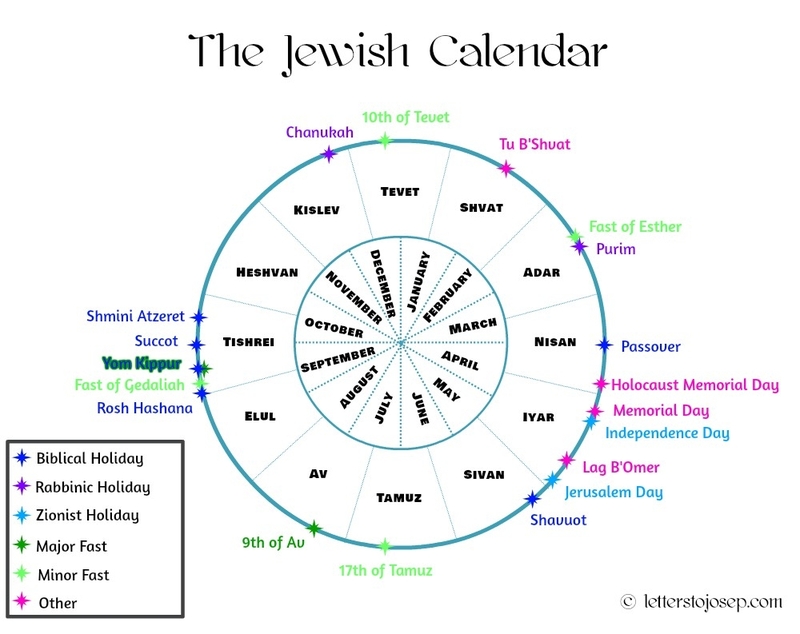 Well, now that I’ve written a comprehensive post for each of the holidays, I can finally make some sense of the Jewish year! And what better time than Gregorian New Year’s Eve, which… has… absolutely nothing to do with the Jewish calendar? It may surprise you to learn that the holiest day in the Jewish year is actually the one that happens every week (with the possible exception of Yom Kippur–but even Yom Kippur is called the “Sabbath of Sabbaths”!). Here is the post about Shabbat and how it is celebrated. On Yom Tov, certain creative activities that are prohibited on the Sabbath are permitted–ones related to the preparation of food. For example, we are not allowed to light fires, but we may transfer them, and use the fire to heat and cook food. On the Sabbath those things are prohibited. There is no requirement to eat a “third meal” on Yom Tov. The prayers are different, depending on the holiday. The kiddush is different, and the havdala service is recited only with wine (no spices or candle). With the exception of Rosh Hashana, the yamim tovim of a holiday last one day in Israel, and two outside of Israel. Explanation for that here. When the Temple still stood, Jews were required to make a pilgrimage to Jerusalem to celebrate the holidays three times a year (the three “regalim”). This is the first day of the new month, or if the month has 30 days, day 30 of that month and day 1 of the next. The first commandment God gave the Israelites, while they were still in Egypt, was to observe this as a festive day. In the days of the Temple, it was celebrated by special offerings listed in the book of Exodus. In our days, it is noted mostly by festive prayers. There are no other special commandments or restrictions. These are holidays instituted by the Sages to commemorate important events in Jewish history. They are of lesser importance in the Jewish calendar. These are Chanukah and Purim. They are not yamim tovim, so work and creative actions are permitted, but each of them have their own requirements (lighting the candles on Chanukah, and hearing the Scroll of Esther read, having a festive meal, exchanging edible gifts with friends and neighbors, and giving to the poor for Purim). Here is a post about the Jewish fast days. There are two major fast days–Yom Kippur and Tisha B’Av–and four minor fast days: 17 B’Tamuz, the Fast of Gedaliah, the 10th of Tevet, and the Fast of Esther. Tu B’Shvat: The “birthday” for the trees, or more accurately, the Jewish agricultural New Year. See this post on the four New Years. Holidays and Remembrance Days of Modern Israel: Holocaust Remembrance Day, Memorial Day, and Independence Day, otherwise known as Israeli Emotional Roller Coaster Week; and Jerusalem Day. Religious Zionist Jews consider Independence Day and Jerusalem Day religious holidays in that we have festive prayers in their honor, but there are no commandments or requirements. Very interesting. I didn’t know that Rosh Chodesh was more important than Chanukah and Purim. It doesn’t really feel that way because practically speaking we don’t do anything differently on Rosh Chodesh. But sure, it’s a commandment from the Torah. Chanukah and Purim are rabbinic. Excellent question!!! We wonder how you don’t get bored and depressed with so few! 😛 In the USA they had to invent dumb things like President’s Day to get a little breather in between your sparse Christian holidays! Anyway, depends what you are expecting us to get done. 😉 The really important things in life–bonding with friends and family, focusing on our spirituality and relationship with God, enjoying the good life has to offer–are things we do with particular intensity on Shabbat and Yom Tov. But in terms of productivity: the Yamim Tovim are the only days on which work is prohibited, and that comes to a total of 8 days in the year. Work is discouraged during Succot and Passover, but not prohibited if it is necessary to make a livelihood. (As a tour guide, Eitan almost always works during the holidays, ’cause that’s when the tourists are here!) On the other days there’s no problem at all with working. With the exception of Purim and most days of Chanukah, they are regular (or half-day) school days, too. Also, remember, we have six-day work weeks. 😉 Your Mondays are our Sundays!